“Sustainability is meeting the needs of the present without compromising the ability of future generations to meet their own needs.” Why is sustainability so crucial? Are we on the right track and will our future generations be able to meet their needs? How is it impacting the marketing perspective of business? To get answers to such questions MarkIIT, the marketing club of Department of Management Studies, IIT Roorkee organized Vipanan on 23rd February in association with Investcare and media partner The Pioneer. 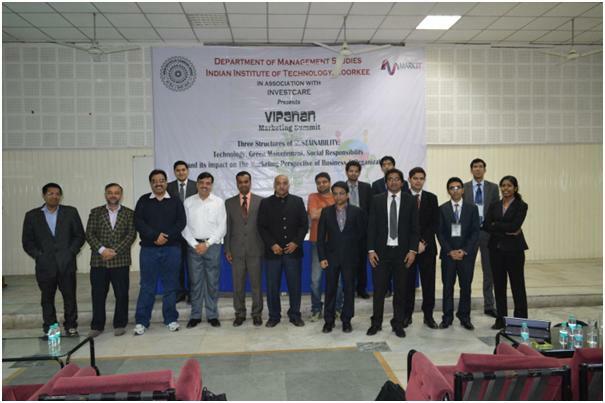 Eminent speakers from the industry Sanjeev Johar, J Chandra Mohan, Rohit Kumar and Guarav Mittal shared their experiences with the faculty and students on the topic “Three structures of sustainability: Technology, Green Management, Social Responsibility and its impact on The Marketing Perspective of Business and Organization”. The summit started with the traditional lighting of the lamp and the welcome address by the head of department Dr. Santosh Rangnekar. 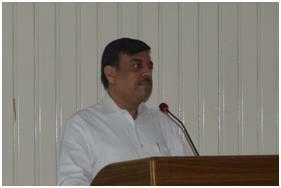 This was followed by the brief introduction of the topic by Dr. Jogendra Nayak. 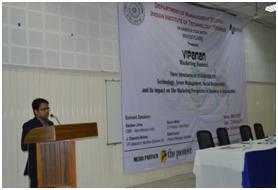 The speakers were then called on the podium to share their views on the topic. Mr. Sanjeev Johar - CMD, Alere Medical India spoke on “Medical Devices (Current and Future Trends)”. He first shared his diversified experience of the various industries he had worked in ranging from FMCG to healthcare. According to him “It is health that is real wealth and not pieces of Gold and Silver”. He spoke of the various enhancements being done in the healthcare industry like miniaturization of medical devices, portability enabling devices to reach patient, ease of use of devices, smart sensor nanotechnology, robotics and connectivity between the devices. He told us about Alere’s Triage System which enables the doctors to take rapid cardiac decisions at the point of care. He also shared his views on Nano-particles, Bionics and Regenerative medicines which are the future of healthcare sector. Maestros Mediline Systems Ltd. Vice-President Mr. J. Chandra Mohan defined “Sustainability” as an inclusive growth of society which is required with a focus on societal development so as to achieve a win-win situation. There is a huge gap between care givers and care receivers and there is a need to bridge the gap. He threw light on the fact of India becoming a Cardio diabetic capital of globe because 50% of deaths occur even before the patient reaches the hospital and thus there is a need for early diagnostics. He explained the concept of Telemedicine by which complex data from medical devices can be transmitted through cloud to the right consultant who can then advise for an appropriate action to be taken for the patient remotely. This concept can be really beneficial as it saves time and expenses, reduces chance of contacting infectious diseases and leads to better utilization of healthcare resources. 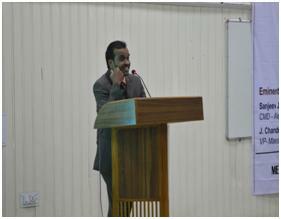 The next speaker to share his insights was Mr. Rohit Kumar - Production Manager, GoodYear. 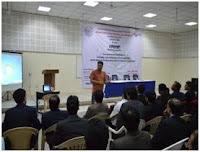 Mr. Rohit, an alumnus of DoMS, IIT Roorkee, spoke on “Marketing Organization – Technology & Sustainability”. According to him, Sustainability is meeting the needs of consumers while preserving the ability of future generations to meet their needs. 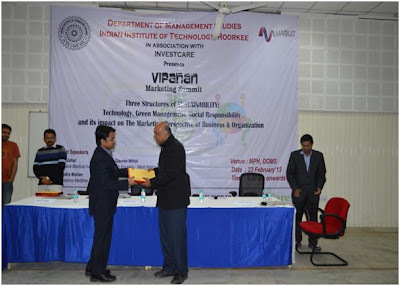 He shared his insights on how he has used the concept of sustainability in his professional life in production of the fuel efficient Bajaj Platina motorcycle and GoodYear Assurance Fuelmax tyres which save 160 litres of fuel. Thus, by increasing the efficiency of manufacturing processes, reducing waste and making a product which is eco-friendly or saves natural resources consumption we can contribute to sustainability. He also threw light on social criticism of marketing because of high prices, deceptive practices and high pressure selling. Last but not the least was Mr. Gaurav Mittal - Marketing Head, Meritnation who also shared his views on the topic and motivated students to be competitive and aim high so as to become market leaders. He also advised that one should do the things one loves to. Finally a panel discussion was held between all the speakers on the topic. The panel was also graced by the presence of Mr. Mriganka Bhowmick, Location Head, Investcare who said that sustainable developments always guide to develop the basic model of predictable business and revenue model as it has minimum exposure towards regulatory risk. “How much money is sufficient for me? 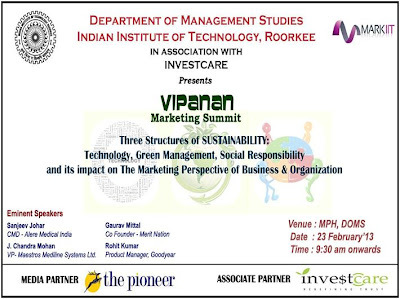 Once organizations will find the answer to this question then the issue of sustainability will vanish” - said by Mr. Rohit. In views of Mr. Gaurav, its society which decides what is right or wrong. If society demands for eco-friendly products then organizations focus on it, CSR activities are all about market competitiveness. 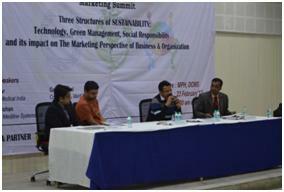 The panelists also discussed on Green sustainability and the future of online businesses. Then the summit was concluded with the Vote of thanks and presenting of mementos to all the guest speakers for taking out valuable time from their busy schedules and making the summit a great success. Surely it was an exceptional knowledge gaining experience for all the students.